For the last few months I’ve been hard at work on a new book project that will be published in 2016. After five cookbooks, this one is quite different. 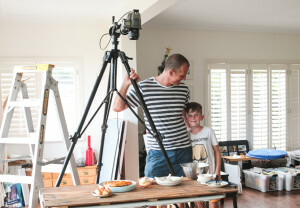 More than simply writing some recipes, or even just cooking them, this time I have decided to put my complete book production skills to the test and am taking on all the challenges – writing, editing, cooking, styling and photography. Add in project management and you’ve got quite a massive job. But seriously, I am loving it. There’s only one more day’s shooting left (provided there’s no reshoots required which is always a hazard on any big project), so I should be able to start sharing some sneak peeks of pages pretty soon. With that in mind I thought I should probably let you all know what the book is about. It’s called ‘Kitchen 52 – Delicious reasons to cook every week of the year’ and it’s full of some of my favourite recipes and ideas. It’s not really a year-round kind of cookbook, rather This book is just a very malleable collection of yummy and fun things. You have the freedom to mix and match tastes and concepts to suit the way you like to eat. To achieve that, the book breaks down into four main chapters – Hearty, Healthy, Short and Sweet. These are pretty self-explanatory. But what makes it different is the way it lays out. Instead of having each pretty picture with a recipe alongside, it’s about those collections of ideas that work together. As such, the photos are all double-page spreads, and each contains four parts. they could be spirit dishes, or the components of just one. It changes from image to image. Turn the page, and there you’ll find the four recipes in full. I guess it sounds pretty straightforward, but shooting food landscape format is sooooooo much more complicated than shooting portrait. I’m not clear why that happens, it just does. Probably it has to do with the way our eye has been trained to look at the page by absorbing media over the years. Regardless, it’s a blast and I’m having a great time. I have to thank bunch of people though, because this isn’t a one-person operation. Sarah, Sarah-Jane and Annalisa for helping bring the food to life. My wife Leah for creating a book from simple words and pictures. Elizabeth for backing me and helping with negotiations. You’re a rock star crew and I love working with you. Anyway, I’ll check in again soon with some more news as the project progresses.